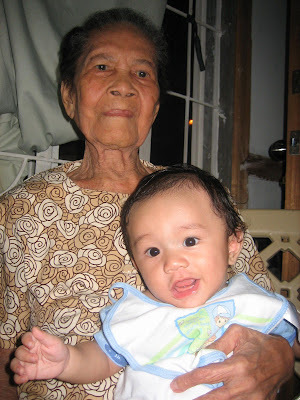 A photo of me and my dear Lola taken way back in 2006 during her 83rd birthday. She is already here and her sight was failing her. She can only recognize people through their voices. Lola and my favorite nephew, Miggy. We were celebrating our late Lolo's birthday last May 2007. I just called my mom early this evening and found out that they were at grandma's for a visit. They have been there since morning, she said. I asked how Lola was and said that she was not so good. Then she handed the phone to Lola and I told her that it was me, and asked how she was. Then I heard a soft voice saying, "Ana? ", and then silence. Mama talked to me again... this time with a shaky voice. I knew she was crying and I was crying too. She told me that Lola was crying too. And that she is now very old and weak. She has been calling out her children's names lately and they fear that she would join Lolo anyday soon. She had a mild stroke stroke weeks back and I all I can do here is pray that she will recover. But I guess old age had taken its toll on my dear Lola. And I just feel so helpless to be here. Right now, I am already grieving on the account that I can't visit her and take care of her in her remainign days. She is turning 86 in April 2009. We are planning to go home in February 2009. But I guess it will be too late by then. It pains me really but I can't bargain with God if He wills it. So my prayer now is that He will allow Lola to live her remaining days here on earth in peace and happiness. I know that she has lived a full life and raised her children and even grandchildren well. Everytime I receive an SMS message from the Philippines, I always find myself fearing of what the message will contain. Because I fear that one day, I will be reading of some grim news. And all I can do now is just pray. And hope and pray again. Please help me pray for my Lola. I will appreciate it a lot. May God bless her.